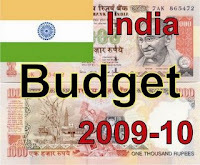 The finance minister of India on Monday outlined plans to speed infrastructure development and unveiled increased spending for farmers and the poor in the first budget since the Congress-led government was re-elected convincingly in May. * "The first challenge is to return the GDP growth rate of 9 percent per annum at the earliest." * "The second challenge is to deepen and broaden the agenda for inclusive development." * "There are signs of revival in domestic industry and foreign investors have also returned to Indian markets in the last couple of months." * "It is possible that the two worst quarters since the global financial meltdown in September 2008 are behind us." * "While the global financial condition has shown improvement over the recent month, uncertainty relating to the revival of the global economy remains. We cannot, therefore, afford to drop our guard. * "We have to continue our efforts to provide further stimulus to the economy." * 2008/09 GDP growth seen at 6.7 pct.